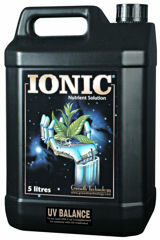 A nutrient supplement for users of UV or Ozone sterilisers. Many growers have found that Ultra Violet Sterilisers are an ideal way to control root diseases like Pythium. Ozone Generators are even more effective for this task and are rapidly becoming more popular. However the use of these devices will strip certain minerals out of the solution in very short time. Ionic UV Balance is carefully formulated to replace the missing ions so it easily solves the problem. It can be added to the tank about twice a week for optimal results.